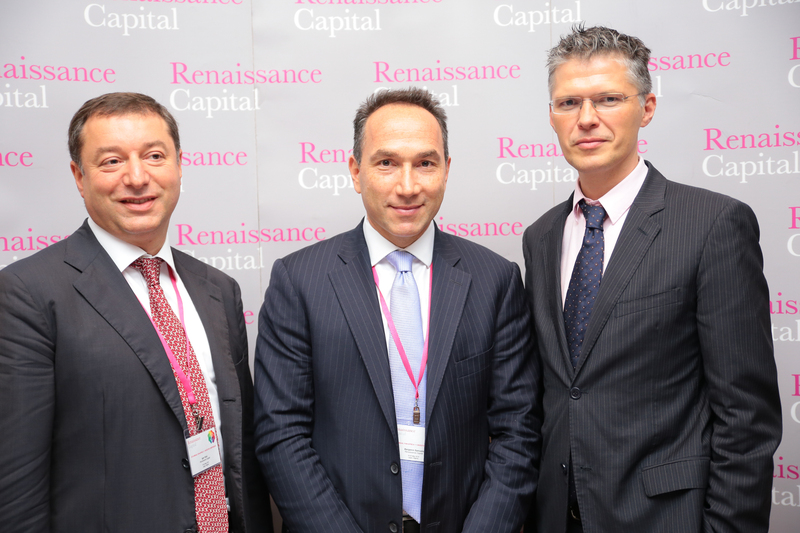 Every year since 2012 the investment bank Renaissance Capital has gathered investors and business executives in Lagos for its 3-day Pan-Africa 1:1 Investor Conference. (The first two editions held in London and Kigali in 2010 and 2011 respectively). This year’s edition, coming between Nigeria’s general elections in March and April, and the handover of power to a new central government (formed by the opposition All Progressives Congress Party (APC) which accomplished the unprecedented by defeating the ruling People’s Democratic Party (PDP) has expectedly been animated by the prospects of the sweeping changes in policy/administrative/ideological direction symbolized by the incoming government. The opening day’s discussions tried to set an agenda for that government that will take office at the end of next week. First there was a keynote speech by Pat Utomi, businessman, politician, and a member of the policy team for the All Progressives Congress Party. His most ambitious proposal was for the delineation of Nigeria into “six zones of development roughly similar to the six geopolitical zones”, identify the agricultural and mining opportunities (which constituted the bedrock of the Nigerian economy in colonial times, pre-oil) in these zones and then link them to relevant global value chains. He also pointed out that these economic development zones should be aligned longitudinally – that is, each one should stretch across (i.e. defy, not reinforce) Nigeria’s un-ignorable north-south divide. The government’s responsibility would be to create industrial parks in these zones, which would then develop into new pan-city centers of economic activity (“megalopolises”). The examples he cited include Lagos-Ibadan, Port Harcourt-Aba, Kaduna-Kano. Finally this new configuration would then influence the design and development of new transport infrastructure links, like a waterway linking Kano in the north with Warri in the delta, or railway link between food basket Benue and southeastern center of commerce Onitsha. It’d be interesting to see more detail regarding this. What it suggests is that serious thinking and even more serious action by a Nigerian government has the potential to completely remodel the country as we currently know it. The panel that followed was moderated by Rencap’s Global Chief Economist, Charlie Robertson; it featured Ayo Teriba, CEO of Economic Associates, a consultancy; Dave Uduanu, MD and CEO of the Pensions Alliance Limited, and Chairman of the Pension Fund Operators Association of Nigeria, Cyril Odu, former CFO of Exxon Mobil in Nigeria, and now a Partner at African Capital Alliance, Kamar Bakrin, Partner at Helios Investment Partners, and Michiel Buitelaar, Managing Director, Smile Communications Nigeria, a broadband services provider. Odu kicked off, focusing on the oil and gas sector that accounts for upwards of 70 percent of oil revenues in Nigeria, and 90 percent of foreign exchange earnings. He said that Nigeria’s primary constraining paradigm is its bundling up of oil and gas industry regulation, policy-making and operatorship in one entity, the state-owned Nigerian National Petroleum Corporation (NNPC). Add the NNPC’s opaqueness to its bureaucratic tardiness and there’s no way Nigeria can realise much benefit from its oil wealth. Regarding the fall in oil prices that will see Nigeria earning as much as thirty percent less this year than it did in 2014 (and which Rencap’s Charles Robertson described as “the single biggest challenge for the incoming government”), Odu said he believes that this will offer an opportunity for structural reforms in Nigeria’s oil-dependent economy. For Odu, unbundling the NNPC and permanently separating the policy, regulatory and operational aspects of oil and gas production are must-dos for the Buhari government. He also said he supports a recent prescription by Central Bank Governor Godwin Emefiele that the new government sell down its stake in the Joint Ventures with International Oil Companies as well as in the Liquefied Natural Gas company, to raise much needed funds for infrastructural development. He added that the reforms should not end there, the NNPC’s subsidiaries need to be urgently privatised. Dave Uduanu had interesting insight on Nigeria’s domestic savings market, outside of bank deposits. Nigeria still has a low propensity for domestic savings, he said, and this can be seen in the rudimentary states of the mortgage, pensions and insurance markets. Even then the pensions industry has seen tremendous progress in the last decade, with a series of important reforms. Today Nigeria’s pensions funds have a value of $25 billion, up from a negligible value at the turn of the century. And there is still great potential yet to be exploited, considering that only a handful of segments of the economy are currently contributing to the pool: federal civil servants, and the “organised private sector” – amounting to a total of about 6.5 million persons. Of Nigeria’s 36 states, Uduanu says only about seven have fully complied with the new ‘Contributory Pension Scheme’ (CPS). He believes that with efforts to expand the pension contributions net to the informal economy (which makes up the bulk of Nigeria’s economy), the number of contributors could rise to 15 million by 2020. Uduanu also had ideas on how Nigeria can expand its revenue base; highlighting that Lagos State – the only one of Nigeria’s 36 states that earns more from internally generated revenues than from the monthly handout from the federal government – ought to be adopted as a model for the federal government. The benefits of expanding the tax net of course go beyond a swollen piggy bank. “Taxes create an ownership society,” he said; when people pay taxes they tend to have higher expectations from their governments. Kamar Bakrin of Helios Investment Partners focused on agriculture (his academic roots lie in agricultural economics). While acknowledging that there have been significant reforms in recent years (under outgoing Minister Akin Adesina), he insisted it was necessary to sift the success from the hype that has inflated it. He also said the reform mainly touched two layers of the sectors — subsistence farming and industrial agriculture — but left out a critical “middle” layer: commercial agriculture, which he defined as “significantly above subsistence but not as large as industrial agriculture” (in terms of farm size he put it at between 500 and 1,000 hectares; compared to the thousands or tens of thousands of hectares needed for industrial farming. As examples of industrial agriculture he mentioned the 26,000-hectare PZ-Wilmar oil palm project in Cross River and Dangote’s $25 million foray into tomato processing). Commercial agriculture would also include ventures like food processing and cold chain logistics. Uduanu said the incoming government will have to do two main things to boost the commercial agriculture layer: fix rural roads and reform the land ownership and tenure system. Panelist Ayo Teriba also touched on agriculture when he said he believes that fixing cargo rail transportation in Nigeria will unleash “explosive” growth. It’s a no-brainer, but somehow Nigeria has developed world-leading expertise in ignoring no-brainers. [The advantages of rail of course extend well beyond boosting agricultural production (reducing wastage, lowering food prices. It also reduces the pressure on the roads, resulting in lower maintenance costs.] In terms of must-dos for the incoming government Teriba says the efficiency of the public sector must be improved – especially when it comes to plugging leakages in revenue collection. He said Nigeria’s non-oil economy is seven times as large as its oil economy, even though the comparative revenue profiles do not in any way reflect this. He would like the new government to extend its leakage-plugging mandate to the non-oil economy as well. Like Uduanu he’s also all for replicating the Lagos revenue model at the federal level. [It’s important to point out that the Lagos model is not without its criticisms – several commentators have pointed out that it’s excessive and exploitative, and that it is a burden that many, especially small businesses, could do without). Media and technology expert Michiel Buitelaar sees plenty of exciting action looming in Nigeria’s technology space, on the back of rising broadband penetration. There will be plenty of growth, he said, in everything from domestic Nollywood distribution (currently dominated by, in his words: “one TV provider and the guys at the traffic lights”) to e–commerce (he namechecked industry frontrunners Jumia and Konga).